David Flores had planned to accompany his wife Dawn and their two children to LEGOLAND Theme Park in Winter Haven, Fla., on Friday, but when 3-year-old colt Higgins got into the seventh race at Tampa Bay Downs, Flores decided to enjoy fun of a different sort. Wise move, as the retired jockey scored his first victory as a trainer with Higgins' pulsating head victory from Lake Nakuru in the mile-and-a-sixteenth turf event. Higgins and jockey Jesus Castanon withstood a claim of foul for alleged interference against Lake Nakuru in the stretch run. Higgins, who broke his maiden in his fourth start, paid $17.40 to win after touring the distance in 1:41.97. Crypto Gold stumbled at the start, throwing jockey Samy Camacho. After several anxious momemts, Camacho was able to walk off the course under his own power but was taken off his last two mounts as a precaution. The victory by Higgins was made more emotional by the longstanding friendship between Flores, a product of Tijuana, Mexico, and Castanon, who is from Mexico City. Flores tried, for both of them. “This is what it feels like when I was riding. It reminds me of how exciting our sport is, and I'm grateful to be around good horses and great people on the other side of the game now. I have to thank (owners) Imagine Racing and Margaret Fauber for giving me this opportunity. Flores rode 3,608 winners in his career as an equine passenger, with more than $150-million in purse earnings, before retiring two years ago at Del Mar. Included among the top horses he rode were Zenyatta, Silver Charm, Siphon, Awesome Gem, Marquetry, Singletary and Street Boss. 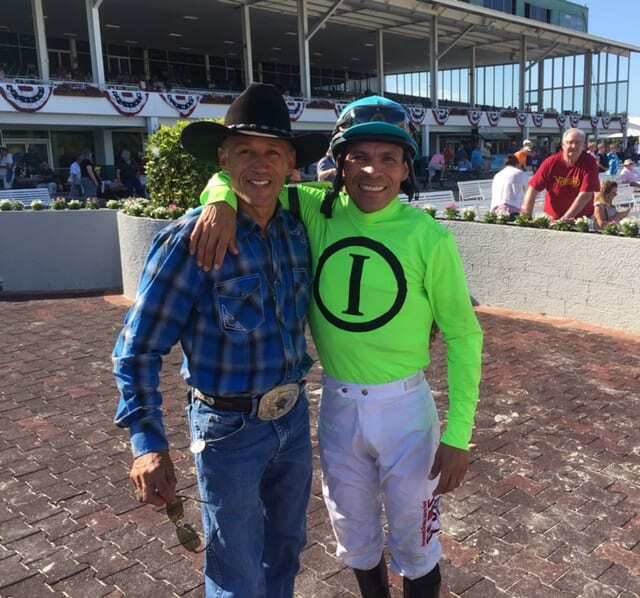 This entry was posted in NL List, People and tagged caliente racetrack, david flores, first win, higgins, Horse Racing, jesus castanon, jockey, retired jockey, tampa, tampa bay, tampa bay downs, trainer by Press Release. Bookmark the permalink.